Dr. Birnbaum's presentation on "Long-haired Monks? A Portrait of Two Chinese Buddhist Masters and its Many Contexts" will begin at 2:00 p.m. and is free and open to the public. The lecture will be followed by a public reception from 3:30 to 5:00 p.m., where refreshments will be served. When two venerable Buddhist meditation masters - Xuyun and Laiguo - met in Shanghai in 1952, a photograph was made to commemorate the event. 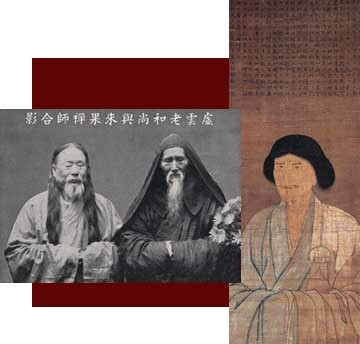 This double portrait fits within a long historical context of images of monks in Buddhist China, most particularly portraits of "special" monks. First, what are the conventions - what is usual and what is unusual in this well-defined visual tradition? Second, these images have a number of distinctly different functions in Chinese Buddhist worlds. How have such portraits been used, and how have they been viewed? What kinds of meanings do these images convey to their intended audience? Third, in addition to thinking of these works as indigenous Chinese productions, we also can consider some conceptual sources brought from India to China, as well as relations to concurrent Tibetan Buddhist portrait traditions. Finally, to bring us in full circle back to the Shanghai image, in what ways do photographs continue the old painting traditions, and in what ways do they present new possibilities? Raoul Birnbaum is professor of Buddhist Studies at the University of California, Santa Cruz, where he also holds the Patricia and Rowland Rebele Chair in History of Art and Visual Culture. He obtained his B.A. from the City University of New York, and his M.A., M. Phil. and Ph.D. degrees from Columbia University. His many publications focus on the world of practice in Buddhist China from medieval times to the present, and includes studies of the place of portraits and biographies in Chinese Buddhist life. Dr. Birnbaum's most recent publications include: Hongyi and his World of Practice: A Buddhist Monk in Twentieth-Century China, forthcoming; Studies on the Mysteries of Manjusri: A Group of East Asian Mandalas and their Traditional Symbolism, Boulder: Society for the Study of Chinese Religions, Monograph No. 2, 1983; and The Healing Buddha, Boulder: Shambhala, third edition, 2001, as well as pieces for such publications as the Journal for the Study of Religion, The Encyclopedia of Religion, The China Quarterly, and the Bulletin of the Society for the Study of Chinese Religions. The Sammy Yukuan Lee lectures are sponsored at UCLA by the Asia Institute and funded by the Lee Family Foundation. The series was begun in 1982 in honor of the 80th birthday of Sammy Yukuan Lee, a noted collector and authority on Chinese art, particularly lacquers, textiles, and ceramics. Sammy Yukuan Lee is now in his 101st year and remains active as an art collector. The lectures have been held annually in recent years and this year's event will be the 16th in the series. The lecture is cosponsored by the UCLA Fowler Museum of Cultural History, UCLA Center for Chinese Studies, and the UCLA Center for Buddhist Studies. The talk is held in conjunction with the Fowler Museum's Art of Rice and From the Verandah exhibitions. Admission to the talk and the exhibitions is free.